Fisher is the common name for a largely arboreal, North American carnivorous mammal, Martes pennanti, of the marten genus (Martes) and weasel family (Mustelidae), characterized by a long body with short legs, dark fur, long and bushy tail, five toes with retractable claws on each foot, long and tapered muzzle, and low, rounded ears. The fisher is agile in trees and has a slender body that allows it to pursue prey into hollow trees or burrows in the ground. Despite its name, this animal seldom eats fish; the name may originate from the French word fichet, which referred to the pelt of a European polecat. In some regions, the fisher is known as a pekan, derived from its name in the Abenaki language. It also is known as fisher-cat. Martes pennanti is found in forested areas of northern North America. With its speed and agility, the fisher is a remarkable predator that captures a wide diversity of prey: Rabbits, hares, squirrels, mice, grouse, and so forth. Even the well-protected porcupine is captured by the fisher, using a unique technique designed to tire the porcupine until the fisher can kill the large quilled rodent. Ecologically, such a role as a top predator makes the fisher an important component of ecosystems in that it helps to control the population of prey species. For humans, the fisher provides another role: For thousands of years the dense, lustrous coat of the fisher has been prized. Over-harvesting of fishers for their fur, along with habitat destruction, caused a significant decline in populations of the fisher in many areas, but today, through re-introductions and protection, they have increased their numbers and continue to play a vital role in the ecosystem and add to the wonder of nature for humans. Fishers are weasel-like animals, related to the minks, sables, martens, ferrets, wolverines, badgers, and otters in the family Mustelidae. Within Mustelidae, fishers belong to the Martes genus within the subfamily Mustelinae. Collectively, members of this genus are known as martens. They are slender, agile, animals, adapted to living in taigas, and are found in coniferous and northern deciduous forests across the northern hemisphere. They have bushy tails, and large paws with partially retractile claws. The fur varies from yellowish to dark brown, depending on the species (it is always dark in the fisher), and, in many cases, is valued by fur trappers. Fishers weigh between 2 and 7 kilograms (4-15 pounds) in adults and are between 65 and 125 centimeters (29-47 inches) in length, including the bushy tail. Males are about twice the size of females, with the smallest females having been recorded being as small as 1.4 kilograms (3.1 pounds), hardly larger than most other martens, and males at as much as 9 kilograms (20 pounds), by far the largest size recorded for the genus. 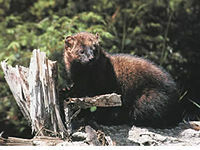 Fisher coats are darkish brown to black, with a black tail and legs; some individuals have a cream-colored patch on the chest. Some of the dark hairs may be white-tipped. The fur does not undergo seasonal changes in color. All four feet have five toes with retractable claws. Because they can rotate their hind paws 180 degrees, fishers can grasp limbs and climb down trees head first. A circular patch of hair on the central pad of their hind paws marks plantar glands that give off a distinctive odor, which is believed to be used for communication during reproduction. Fishers are also known for one of their calls, which is often said to sound like a child screaming, and can be mistaken for someone in dire need of help. 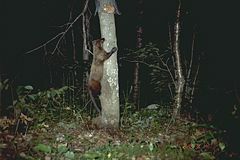 Being largely arboreal, fishers are most often found in coniferous or mixed forests with high, continuous canopy cover. They avoid open spaces. Recent studies, as well as anecdotal evidence, suggest that the highly adaptable fishers have begun making inroads into suburban backyards, farmland, and even semi-urban areas in Michigan and Pennsylvania (Zezima 2008). 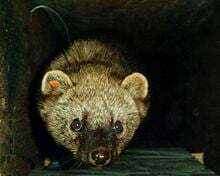 The fisher is found from the Sierra Nevada in California to the Appalachians in West Virginia and north to New England (where it is often called a fisher cat), as well as in southern Alaska and across most of Canada. Fishers are present in low density in the Rocky Mountains, where most populations are the result of reintroductions. There is recent evidence, however, that a Montana population persisted in a refugium despite extensive fur trapping in the area during the 1800s and 1900s. They have spread from Vermont into southern New Hampshire, Massachusetts, and northern Rhode Island, and have recently been artificially reintroduced into dozens of areas across the United States, including in Montana, Oregon, and Washington. Fishers, native to Washington State, have not been known to exist anywhere in the state for generations because of over-trapping in the 1800s and early 1900s and the loss of old-growth forests (Mapes 2008). Fishers are solitary hunters. Their primary prey include hares, rabbits, squirrels, mice, shrews, porcupines, and sometimes domesticated animals. Their diet may also contain small birds, fruit, and berries, as well as deer in the form of carrion. Fishers are also known to eat ground nesting birds such as grouse and turkeys. Often, young of the year and eggs make easy targets. While fishers and mountain lions are the only regular predators of porcupines, the fisher is the only predator to have a specialized killing technique. A fisher first approaches from the direction the porcupine is facing. The porcupine tries to protect itself by turning to present its tail, covered with quills, to the attacker. The fisher then jumps directly over its prey, forcing the porcupine to keep turning to protect its vulnerable head. A dozen or more such maneuvers suffice to exhaust and confuse the porcupine into a stupor in which it can no longer protect itself. Then, by repeatedly biting and scratching at the porcupine's face, the fisher causes it to bleed to death. The fisher eats the porcupine by flipping the dead animal over and starting with its unprotected belly. 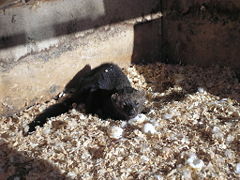 In some areas, fishers can become pests to farmers because they will get into a pen and kill large numbers of chickens. Fishers have also been known to eat feral cats and dogs and small pets left outdoors. While predation on domestic animals is rare, when densities of fishers are high and food resources are low, these animals may become desperate. Fishers have been implicated in attacks on cats (O'Brian 2005; Fahim 2007). A study done in 1979 examined the stomach contents of all fishers trapped in the state of New Hampshire. Cat hairs were found in only one of over 1,000 stomachs (Orff). Attacks on domestic cats may be documented, but zoologists suggest a bobcat, coyote, or dog is more likely to kill domestic cats and chickens. Fishers have also been recorded to prey on both lynx and bobcat (Vashon et al. 2002). Fishers are solitary, only associating with other fishers for mating purposes. They mate during the spring time and raise their babies until early summer. Female fishers first breed at one year of age. The fisher breeding season spans late February through late April. There is a ten-month delay after breeding before implantation of the blastocyst phase of the embryo occurs, resulting in a one-year gestation period. Litters are produced annually. The young are born in dens high up in hollow trees. Kits nurse for about 4 months and begin to eat meat before they are weaned. The kits' cries resemble that of baby kittens. During the past two centuries, fisher populations have occasionally declined due to trapping and habitat loss. Their soft brown pelts can fetch high prices. Fishers are shy, secretive, and difficult to breed in zoos. On March 23, 2008, three fisher kittens were born at the Minnesota Zoo in Apple Valley, Minnesota (Harlow 2008). In New England, fishers, along with most other furbearers, were nearly exterminated due to unregulated trapping since the mid-1800s. Also, much of the forest habitat preferred by the fisher was put to agricultural use. Some measure of protection was afforded in the early 1900s, but it was not until 1934 that total protection was finally given to the few remaining fishers.The fisher was again abundant enough in 1962 to warrant an open trapping season. During the early 1970s, the value of fisher pelts soared, leading to another population crash in 1976. After a couple of years of closed seasons, fisher trapping re-opened in 1979 with a shortened season and restricted bag limits. The population has steadily increased since then, with trappers taking about a thousand fishers per year in the late 1990s, despite a much lower pelt value. Fishers were reintroduced into several states including Pennsylvania, Connecticut, and West Virginia after being nearly wiped out by trapping and habitat destruction in much of North America, sometimes in an effort to control porcupine populations. Fahim, K. 2007. A cat fight? Sort of, only louder and uglier. New York Times July 4, 2007. Retrieved November 19, 2008. Harlwo, T. 2008. Minnesota Zoo visitors get chance to see fisher kittens. Star Tribune April 18, 2008. Retrieved November 19, 2008. Mapes, L. V. 2008. Weasel-like fisher back in state after many decades. Seattle Times January 28, 2008. Retrieved November 19, 2008. O'Brian, K. 2005. On the wild side: Once nearly extinct, weasel-like fishers thrive in the suburbs, where their ravenous feeding habits threaten family pets. Boston Globe August 25, 2005. Retrieved November 19, 2008. Orff, E. P. n.d. The fisher: New Hampshire's Rodney Dangerfield. New Hampshire Fish and Wildlife News. Retrieved November 19, 2008. Powell, R. A. 1993. The fisher: Life history, ecology, and behavior. Univ of Minnesota Press. ISBN 9780816622665. Reid, F., and K. Helgen. 2008. Martes pennanti. In IUCN, 2008 IUCN Red List of Threatened Species. Retrieved November 19, 2008. Terres, J. K. (ed.). 1958. The Audubon Book of True Nature Stories. New York: Thomas Y. Crowell Company. Vashon, J., A. Vashon, and S. Crowley. Partnership for Lynx conservation in Maine. December 2001 - December 2002 field report. Maine Department of Inland Fisheries and Wildlife. Retrieved November 19, 2008. Zezima, K. 2008. A fierce predator makes a home in the suburbs. New York Times June 10, 2008. Retrieved November 19, 2008. This page was last modified on 11 April 2017, at 23:25.